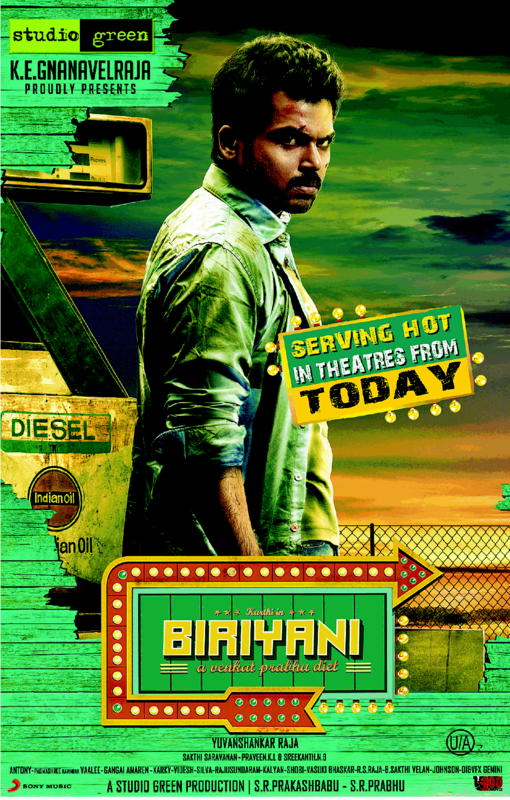 Biryani is another Venkata Prabhu mark thriller. Its a story of two young star’s who ran into problems in Hang over. Karthi performed very well as Sudheer, Premgi rocked again with his comic timing. All the other cast did well upto their character. Venkat Prabhu who scored big hit with Mankatha ( Gambler in Telugu ) came up with his mark thriller again. Movie went flat in first hour but picked up pace from 3rd song. Venkat Prabhu always goes up with some suspense element & at the pre climax twist reveals. His earlier movies also got the same treatment but in case of Biryani twist looks complicated & artificial . Specially at the ending sequence.Director Venkat diverted the audience in every frame in 2nd half but after the twist one can confirm that there is no need of diversion screenplay. Any way he failed at the end but most of the sequences worked out well expect pre climax. Saravan’s cinematography was too good specially some unique camera angles in chasing sequences. Songs & Bgm was ok But onscreen songs doesn’t create much impact & in first half songs became speed breakers for the screenplay.